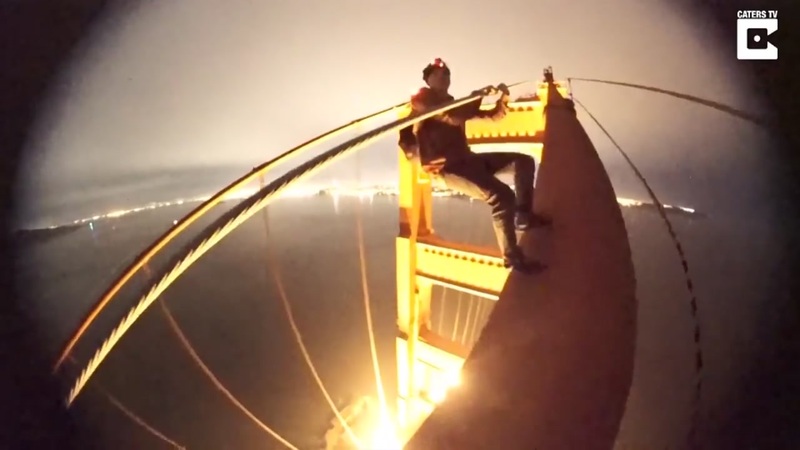 SAN FRANCISCO -- The video will surely make your palms sweaty and stomach churn - two young daredevils climbed to the top of San Francisco's Golden Gate Bridge. It was all caught on camera and it's raising some serious questions. At a news conference Tuesday afternoon, Golden Gate Bridge, Highway and Transportation District General Manager Dennis Mulligan had stern words for the duo, "The Golden Gate Bridge is not an amusement park ride, it is vital public infrastructure and it's a symbol of our community. People should not come here and use it in ways for which it is not intended. They should not put themselves and others at risk. And if they do, we will bring the full consequences that we can, both civilly and criminally, to bear upon them." At a news conference Tuesday afternoon, Golden Gate Bridge, Highway and Transportation District officials addressed a video that's gone viral showing two daredevils climbing the bridge and doing somersaults and backflips at the top. Here's a look at the full news conference. In the video, daredevil Peter Teatime and his exploring partner Tommy Rector are seen sprinting up the bridge's frame, even doing backflips and somersaults. At one point the two are seen hanging off the edge of one of the bridge's towers, seemingly without any safety equipment, with just their fingertips for support. At the news conference, Golden Gate Bridge Patrol Captain Lisa Locati said the duo's "path of travel did not trigger any alarms" and went on to say, "I want to assure you that the bridge is safe, it is our job to keep it safe. Our security systems are developed to keep people from harming the structure. Our security system is not designed to prevent thrill-seekers from harming themselves. Individual people climbing, as these two people did, will not harm the structure." She went onto say, "That having been said, their behavior could have harmed motorists below. And does highlight a public safety issue that needs to be addressed. It also raises questions about how such an unauthorized climb is possible. If either of these young men had slipped or fallen, there could have been serious harm to motorists below." Mulligan said the challenges that the bridge district faces are similar to what other agencies deal with, where "individuals may run out on the White House lawn or may run out on the ballfield at a 49ers or Giants game." He added, "Our efforts are focused on protecting the structure. The actions of these individuals did not harm the structure, nor could they have harmed the structure. However, they do highlight, very clearly, that we have a shortcoming with respect to a roadway safety threat associated with people dangling from the bridge above traffic."